Talk about an Appetite for Destruction. I’d been waiting for this day since my junior year at East High. Back then, Use Your Illusion I & II were pretty much the soundtrack to lunch. We’d crank those albums as we headed to one of our usual spots, top three in the rotation being Taco Bell, KFC, and Dog & Shake (the latter a Wichita, Kan. favorite). So to properly commemorate the release of Chinese Democracy -- “Music’s Most Anticipated Album EVER” -- step two had to be grabbing something to eat at KenTacoHut. If only there was such a thing as a KenTacoDog&Shake. If only. But I’m getting ahead of myself. What was step one of the proper commemoration, you ask? Enjoying some Ten High, the preferred bourbon of high schoolers everywhere. 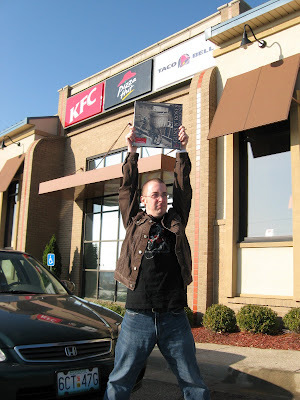 Shaw and I conquered this task in the Best Buy parking lot before we went in to get my copy of Chinese Democracy. (On vinyl, thank you.) I was surprised to see there wasn't a line at Best Buy -- I thought for sure we'd have to wait around at least a little bit what with Chinese Democracy nearly 15 years in the making. Not so much. Since we had a little extra time before KenTacoHut opened, we took the opportunity to conquer step one again. There was already one guy outside KenTacoHut when we got there, waiting to pick up like a dozen buckets of the Colonel’s legacy for a Chiefs tailgate party. Thus, at least in Overland Park this Sunday morning, there was a greater demand for KFC then GNR. OPKS, you are not a city of rock. Once they let us in and dude had his chicken, I stepped up to the KFC counter and ordered a Famous Bowl. That’s Popcorn Chicken, mashed potatoes, corn, gravy, and cheese all layered in a bowl together. I’d had a morbid curiosity about this thing for a while. Clearly the most likely explanation for the origin of the Famous Bowl is that a bunch of KFC bigwigs used dark magic to conjure forth the Colonel from the great beyond so that they might seek his guidance, to which the Colonel -- now undead and none too happy about it -- said, “I say now boy, just put a bunch of stuff in a bowl, you hear?,” right before he ate the brains of all but one survivor who lived to tell the tale. The Famous Bowl is that sinister. On the other hand, there is Popcorn Chicken in it and that’s delicious, so how bad could the Famous Bowl be? The answer is that the Famous Bowl was surprisingly tasty. For four bites. And then it all went to hell. The Popcorn Chicken turned soggy and the chicken-potato-gravy ratio got hopelessly thrown out of whack and it was just no good. Which is too bad because the Famous Bowl is kind of big -- you’re going to end up with a lot left. KFC, against my better judgment I might be compelled to try your Famous Bowl a second time if you came out a smaller version, like about the size of a pudding cup. You could call it the B-List Famous Bowl. Or make people order it Child Star Sized. Shaw and I ended up taking turns holding big sporkfuls of our leftover Famous Bowls upside down to see how long it would take for gravity to do its business. We topped out close to 30 seconds. Feeling like I needed to take advantage of more that KenTacoHut had to offer, I also ordered a Chili Cheese Burrito and a Volcano Taco from Taco Bell, and quickly learned a valuable lesson -- it’s probably not the best idea to go to Taco Bell before noon, and you certainly never want to be the first order of the day. Taco Bell needs a little bit of time to warm up and find its groove. Three days later on Thanksgiving Eve with nowhere better to go for lunch, we found ourselves at a different KFC ready to check that action out. We each got it with an Original Recipe thigh and a Buffalo KFC Snacker. It was good. As well it should be -- it’s a box full of fried chicken-related awesomeness. Even if we agreed that the thigh was the weak link in all this. See, in the KFC Big Box Meal, you’ve already got a KFC Snacker plus Crispy Strips and a couple of different sauces to dip them in. If KFC wants its actual traditional fried chicken to come off as anything more than a greasy afterthought, they need to give you a fried chicken breast, or at least two pieces like a drumstick and a thigh, or maybe two drumsticks. Not two thighs, though -- somehow it seems like that would be even more unremarkable. For a solitary thigh or drumstick cannot hold its own all by itself -- it’s just not enough to make an impact. To truly function at full capacity, it needs to accompany another piece of bone-in fried chicken. I would’ve happily traded in the thigh for a few bites of Popcorn Chicken. The sides were good -- we both went with mashed potatoes, and macaroni and cheese. However, we must note that in the world of fast food fried chicken side dishes, they’re all completely owned by the red beans and rice at Popeyes. Make no mistake, we’re fans of the KFC Big Box Meal. Quite frankly, what it all boils down to is that we’re suckers for ridiculous quantities of food that comes in a box. It’s like a Happy Meal for adults. The only thing missing is a cool toy surprise to distract you from thinking about the fact that in one sitting you just ate like a total of nine chickens. That said, if KFC wanted to throw a Child Star Sized Famous Bowl in the box, I certainly wouldn’t be opposed.